You can fit the data with standard oscillation models. The problem is you cannot also fit all the other data with the same parameters. Look at the first figure in my blogpost - it's a totally different parameter range. I never understood why sterile neutrinos are not a straightforward prediction of the standard model: we have right-handed electrons, muons and taus, so why not right-handed neutrinos, which are sterile? Seems to me it would be mysterious if sterile neutrinos did not exist. Can you straighten me out? It's pretty confusing, but I think the clearest way of saying it is that LSND and this new result are incompatible with there being only 3 mass eigenstates in the mixed-up neutrino sector. Even if you consider Standard-Model Dirac-mass neutrinos, you don't get extra mass eigenstates from the right-handed (sterile) neutrino modes. So physicist woke up the other morning and were informed that on the previous days, they were wrong. Only in science is that considered Good News! Sorry to double-comment, but it did also just occur to me that these results are at odds with cosmological constraints on the number of relativistic neutrino-like particles, which is known to be 3 with pretty decent precision. Many of the LSND experimenters are now on MiniBoone (but they are good experimenters and presumably try to avoid any bias). There is some suspicion about low energy backgrounds in both experiments, and those will be checked by MicroBoone within a couple of years. Xerxes' last comment is correct, and that's why I'm somewhat suspicious. Time will tell. "some kind of symmetry violation, typically CPT violation or Lorentz-invariance violation (or both)" CPT violation crashes quantum field theory, Lorentz invariance violation crashes relativity. Vacuum is fundamentally trace chiral anisotropic by ~0.1 (direct coupling) to ~1 part-per-billion (coupling constant). Grow space groups P3(1)21 (right-handed helices) and P3(2)21 (left-handed helices) single crystal benzil. Silanized jelly jars, mixed xylenes, a week. Borrow two differential scanning calorimeters. Benzil melts at 95 °C. Left and right shoes fit a vacuum left foot with different energies. Their differential enthalpies of fusion to achiral molten benzil will be sinusoidal over 24 hours. I know it's early for a theory or hypothesis however; do you want to speculate on what this might mean? Adding three new types of neutrinos seems to be the best fit see, for example, arxiv 1512.05357 and 1207.4765. There are ways around the cosmological bound, for example, arxiv 1501.00059. But more interestingly, a new light Higgs boson could be responsible for the anomaly. For people who are interested in this possibility, have a look at arxiv 1712.08019. As pointed out in http://dx.doi.org/10.1155/2015/362971, the authors write "In fact, existing limits from MiniBooNE , MINOS [104–107], IceCube , and Double Chooz [109, 110] set very tight limits on possible Lorentz violation in the neutrino sector at the terrestrial level" which suggests that Lorentz violation is probably not involved. This is a heretical thought, but might it be that neutrino mixing doesn't actually occur at all despite apparently overwhelming theoretical and experimental evidence/agreement? In other words could it be that the seemingly airtight interpretation of multiple experiments as evidence for mixing is actually the result of some other process at work, which in turn underlies the current confirmed anomaly? Way back in the early 90's a ridiculously simple idea popped into mind to explain the existence of the muon-neutrino and tau-neutrino. But the idea essentially required these higher generation flavors to always be conserved in the end products of particle interactions, along with some extra 1st generation neutrinos (electron-neutrinos) to balance accounts. Sent off a bunch of papers in 1994 to various journals with no luck. Unfortunately, the confirmation of neutrino mixing put the kibosh on this idea. And, realistically, any hope that neutrino mixing isn't true is probably wishful thinking. systematic error? Are the types of likely systematic error the same or MiniBooNE? Steve - it's easy to adapt the Standard Model to include right-handed neutrinos. In fact my favorite grand unified theory, the so-called SO(10) GUT, predicts the existence of right-handed neutrinos in a very beautiful way: you need them to get all the fermions in each generation to fit into one irreducible representation of the symmetry group. However the most popular versions of this theory make the right-handed neutrinos very heavy, to make the rest very light by the "see-saw mechanism". I don't know if such heavy right-handed neutrinos are compatible with the new data. Experts must have thought about this. I wish I had enough free time to build up an input set to feed Al Schwartz's comments into dadadodo, which tends to produce superior output in such monotonous cases. As you probably know, for the oscillations it's not the masses themselves that matter, but the mass-differences (or differences in mass-squares to be even more precise). The right-handed neutrinos are usually assumed to be heavy (and Dirac) because then you can use the see-saw mechanism to suppress the masses of the left-handed neutrinos. Having said that, I don't know the allowed parameter space, but I suspect if you make the neutrino too heavy it'll mix too quickly (have a look at Figure 3 - you actually see a gradual increase of the mixing). I'm not the right person to ask about specifics of these experiments. Let me just say that the whole reason to do another experiment to check the result of the first is to decrease the risk of systematic error. Yeah, sure, and good luck with that. I actually don't know. I guess it'll be a boost for sterile neutrinos as dark matter candidates. And what about DAMA? We will probably see a lot of papers about this in the coming months. That number of three plus/minus something depends on how the neutrinos were produced. As Louis W mentions above, there are ways to avoid this bound. I'm not sure how plausible it is - theorists are an inventive crowd - but certainly possible. The problem appears to be a bad match with degrees of freedom. This might have a number of sources. It could mean there are sterile right handed neutrinos. It might be there is an extra family of quarks and leptons, such as SU(4) QCD, or it might mean the Higgs particle we have fundamentally wrong. Maybe this will breathe new life into technicolor. It could be there is something strange going on with CP violation. Maybe there is something odd going on with neutrinos and axions. Odd is the operative word. Most discoveries do not start with a EUREKA!, but with a "hmm, that is a bit odd." I apologize for making a second comment however the article raises so many unanswered questions. Have there been discussions as to why LSND and MiniBooNE detect the anomaly and other neutrino experiments don’t? If you’re aware of information you can direct me too, I’d like to know more. This is good! As I recall, the standard model has nothing to say about neutrino masses. The mass matrix is almost complete, and plans are afoot to close the circle. Now it appears that there may be big things lurking in the neutrino sector. That is good news for a field that is itself currently nearly sterile. As someone totally ignorant, I just want to confirm that the main point of this testing\discussion is that these sterile neutrinos make up missing dark matter? A fourth generation is ruled out by other experiments, so that won't work. What's with the axions, I don't get the connection. I am not a neutrino person, so please don't consider me an expert on the matter. 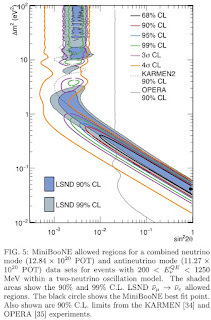 The thing is that LSND and now MiniBooNE use different sources for neutrinos. All the other experiments measure either neutrinos from the sun, or reactor-generated neutrinos, or cosmogenic neutrinos. The way that neutrinos are generated determines their typical energy, and the typical energy determines the oscillation distance. The original LSND experiment also primarily produced anti-neutrinos (hence the idea to explain the matter with some symmetry-violation), but for all I can see MiniBooNE doesn't find a difference between neutrinos and antineutrinos. This is also the reason why it isn't entirely implausible that there is something at odds in one of the other factors that determine the measurement. Roughly speaking, if you want to model what the neutrinos do you need a) the production numbers b) whatever happens during travel and c) the detection probability. These three things you essentially multiply together. Now what MiniBooNE finds is that the result doesn't match expectations and puts the fault at b) whatever happens during travel. But in principle the culprit could be a lacking understanding of either production or detection. If sterile neutrinos exist they would certainly make up a part of dark matter. Using these neutrinos to make up all of dark matter is difficult. Roughly speaking, they seem to be not heavy enough. At least most of the literature on sterile neutrinos as dark matter considers much heavier sterile neutrinos than what you'd need to fit this data because the lighter neutrinos are in conflict with several bounds. This doesn't mean it can't work, but at least at first sight it's not obvious to me how. A 4th generation of quarks and leptons with masses comparable to masses of the three known families is ruled out. If they are very much more massive things are less certain. We might think of gravitation as not being so much weak as it is that elementary particles are very light. As for axions, they are Peccei–Quinn theory scalars of CP violations connected to QCD. The possible problem might be with some unknown physics with CP violation. The talk of right handed neutrinos and sterile neutrinos borders on this. I do seem to remember some result that put more limits on sterile neutrinos or maybe eliminated them. This comment is in line with "what if?" What if there is some new physics with CP violations we have not considered? Jeffrey, dark matter wasn't even on my mind as I read the post, nor was it mentioned in the post, so if it was the main point it went way over my head. As I read it, the main point was that there is some new data, that is reproducible, which isn't predicted by our currently-accepted theories of physics, and therefore we need to expand those theories somehow. That is tremendously big and good news for physicists, as has been pointed out in previous comments. However, the possible tie-in to dark matter is an interesting thought. This is the first evidence I have heard of that there might be undiscovered particles, and dark matter needs new particles. All other searches for dark matter particles have not panned out, so prospects for dark matter were starting to dim (no pun intended). PS: Sorry for screwing up the thing with the Dirac/Majorana masses. Now that I think about it, I knew this of course. "for once we have an anomaly that did not vanish with further examination"
There are others, of course. Essentially all of the "CMB anomalies" found by WMAP and other observations (I really don't like the term "experiment" in connection with CMB (or other) observations) were confirmed by Planck. Hi, my name is Teppei and I am one of authors of this and let me give my comment. We checked everything and there is excess, but somehow not quite same from what I expected. I don't think we made mistakes in data taking..., identifying isolated electromagnetic shower is very easy for a spherical Cherenkov detector. So the data is data. Question is what it is exactly. It always bothers me that the shape of data distribution is more similar with gamma rays (background, sharp peak at low energy), than electrons (from electron neutrino and oscillation candidates, mild peak at middle energy). Indeed, new BSM mechanism to produce a single gamma ray (such as dark photon oscillation, new neutrino NC gamma production process) could be a solution and we might make a big discovery! well, but since I am experimentalist, I would suspicious any potential source of gamma rays we are missing from our simulation. Let's assume the excess is not oscillation signal (electrons) but background (gamma rays). Then it's unlikely these high energy gamma rays are produced in the detector..., for this we need to be 100% wrong to predict pi0 (pi0-->gamma+gamma) production rate or Delta resonance (Delta-->N+gamma) rate, this is unlikely since we can calibrate these processes internally (I am also bit suspicious about this process). Then the only source is unknown process to produce single gamma (either SM or BSM) or gamma rays sneaking into the detector in the way we couldn't simulate by the current simulation. We are continuously working on this. Meantime, follow up experiment called MicroBooNE will release data soon. That is located right next to MiniBooNE (so they receive same neutrino beam) and it has an ability to distinguish gamma rays and electrons, so they may clarify the issue before MiniBooNE. To be clear, I do not think there is anything wrong with the experiment as such. As you say, the data is the data and we need to interpret the data in some fashion to figure out why it is not matching Standard Model expectations. I am also completely certain that you guys control your backgrounds better than I do (but yes, the shape being similar to gamma rays did occur to me as well - the similarity of the signal shape to the pi0 misid is eye catching, but I would be very surprised also if this was the issue). The only think I am arguing for is that I would be equally surprised, based on the global picture, if your signal was indeed due to sterile neutrino oscillations. 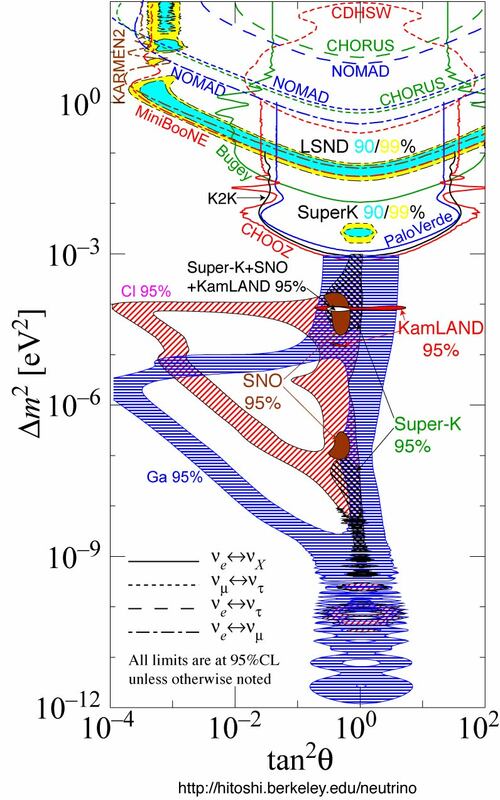 I was very curious about the "intrinsic [electron-neutrino] background component from kaon decay...", referenced in , on page 2, near the bottom of the first full paragraph, of the arXiv:1805.12028v1 paper. But, try as I might (from home computer), I can't seem to pull either paper up at the Physical Review D site. I put in all the relevant info in the Phys. Rev. D. search engine, but it always comes up with "0 matches". Perhaps I will need to resort to visiting our nearest city library that carries back issues of this journal to obtain copies of these papers. You don't need to go library to get any of these papers. Every paper by high-energy experiments are available on arXiv and found there. https://arxiv.org/abs/1105.2871 So why we don't put arXiv number in the paper instead of journal number? This is just a tradition. I also gave a seminar on this topic on June 14 at UCL HEP group so please take a look slides, too. 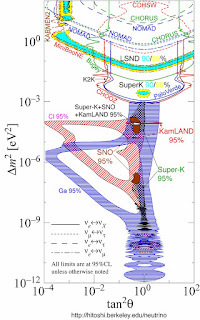 K-decay neutrino constraint is discussed in p42-43. Thank you for informing me about all high-energy experiments being available on the arXiv, but not always being listed in the references of papers, and for providing links to the paper I was interested in, and your talk on the same subject. I'm eagerly looking forward to reading those. I always like looking at slide presentations, as they tend to encapsulate key ideas, or as they say "a picture is worth a thousand words". I went to the page for the UCL HEP group, where your slide presentation was linked, and was delighted to see a smorgasbord of papers on neutrino experiments. But I discovered that all the [slides] URL's that end with "year=2018", including yours, just bring me back to the same page. The URL's that end with "pdf" do link to the particular paper, however. Is there another location where your slide presentation is in pdf format? My interest in neutrino physics runs deep. I had an idea way back in the 90's for why there are two extra families of quarks/leptons, but won't mention it here as it's against the rules. In any case, the absolute confirmation of neutrino mixing with a wide range of highly sophisticated experiments appeared to be incompatible with this idea, although I wasn't completely sure. If you were interested in seeing it I could privately email, as I think the emails of the authors of the MiniBooNE short baseline experiment are listed someplace. "So why we don't put arXiv number in the paper instead of journal number? This is just a tradition." There are other reasons. The main one is that it shows where it has been published. arXiv is great for distribution but, although there is some quality control, submissions are not refereed. Yes, there is some good stuff which is on arXiv and nowhere else, and occasionally some trash gets published in otherwise reputable journals, but these are exceptions. Being published in a reputable journal is a mark of approval, proof that someone has actually checked the work. The system is not perfect, but much better than no system at all. Given the journal reference, it is easy to find the corresponding arXiv submission. Sadly, this is not always updated to reflect the published version.